The first time I laid eyes on the llama in the Birthday Fiesta set I knew I had to have him! And I knew exactly what I wanted to do! I wanted to make a Llama Pinata! And I wanted the Pinata hanging above a bunch of people in party hats! Don’t ask me why, or what prompted that thought, but that’s what I wanted to do. And today, I did it. 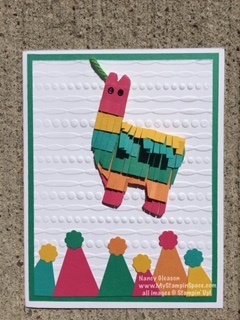 My Fringe Scissors helped me make layers of fringed cardstock that I used to cover the llama which I had cropped out of coaster board (retired) using the Fiesta Time Framelits. After I layered the fringe, I just snipped around the coaster board llama. The Llama Pinata is dangling from a piece of Baker’s Twine. The party hats were simply cropped from the end of the Tree Punch and topped off with a little scallop circle (Both punches are now retired as well). The background has a festive, party mood thanks to the “Festive” TIEF. Ok, so I know that the eyes make him look a little wonky. Maybe I would have been better off leaving no eyes on him at all in retrospect. But I still am glad for the chance to bring my vision of a Llama Pinata to life! I have more cards that I made with this product suite that i will be sharing in the next few days. If you feel that you need to have this Product Suite too, click here to start shopping! This Product Suite has a stamp set, Framelit dies, Designer Serires Paper and TIEF. And you can BUNDLE & SAVE on the stamp set and Framelit dies! A Cardstock pack is also available. But please remember a few things: Did you get everything you want from the new annual catalog yet? Since it came out only a month ago, you probably still have some items on your wish list, and we have some great news for you! 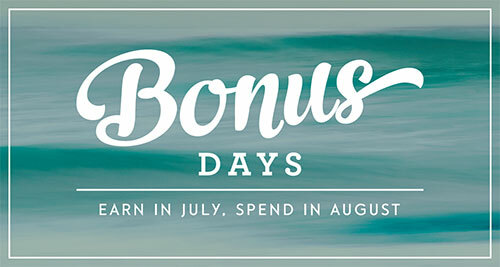 For every $50 USD you spend in between July 7 and July 31, you’ll get a $5 USD Bonus Days coupon that you can use August 2-31. This is a great opportunity to shop from your wish list, whether you buy your favorite products now or later in August with your coupons! To celebrate my recent milestone achievement (you can read about that here) I am going to give EVERY CUSTOMER who places an on-line thru me of $50 or more, a package of my favorite new embellishment from the 2016 Annual Catalog. 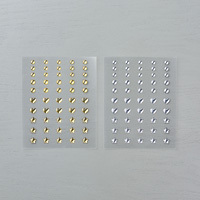 The Metallic Enamel Shapes are such a versatile addition to our Embellishment offering! With hearts, stars and 2 different sizes of circles, there is something here for almost every project! So click here to start shopping and get double the gifts when your order reaches $50 (before shipping and tax). Hey, if you would use this Host Code when you place your order, I’d appreciate that: B47BNP6. Several folks have already placed an order with me and earned the free embellishments. Will you be next? ← All the ‘thanks’ belong to you!